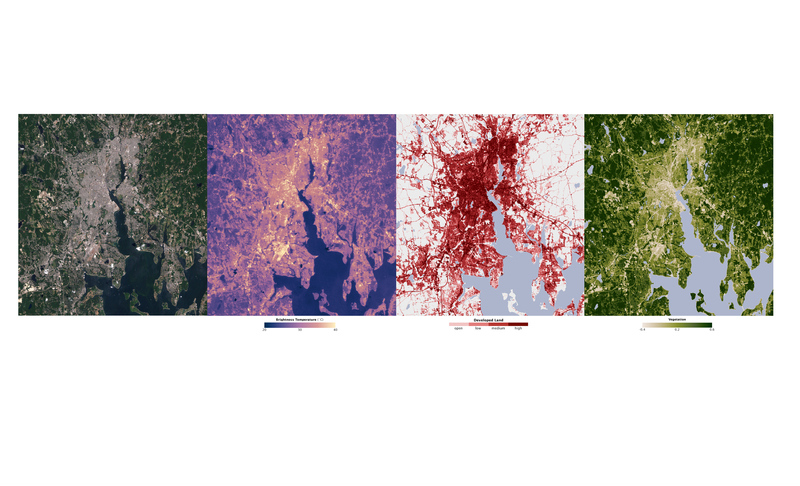 Satellites Image the Urban Heat Islands in the Northeast | Watts Up With That? “This, at least to our knowledge, is the first time that anybody has systematically compared the heat islands of a large number of cities at continental and global scales,” said Ping Zhang, a scientist at Goddard and the lead author of the research. 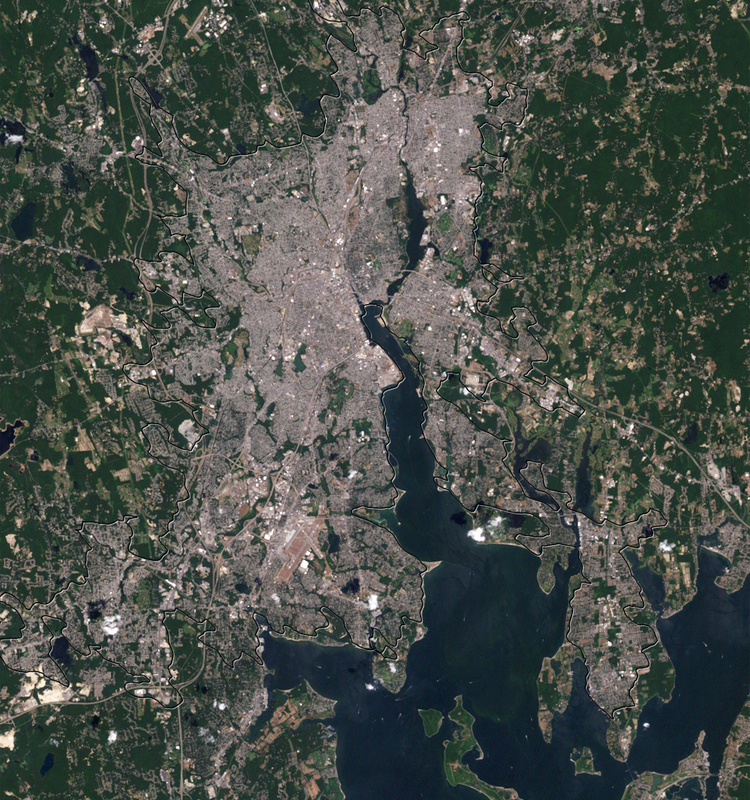 The new method for comparing cities, which the team of scientists has honed for about two years, involves the use of maps of impervious surface area produced by a United States Geological Survey-operated Landsat satellite, and land surface temperature data from the Moderate-resolution Imaging Spectroradiometer (MODIS), an instrument aboard NASA’s Aqua and Terra satellites. Impervious surfaces are surfaces that don’t absorb water easily, such as roads, roofs, parking lots, and sidewalks. Land surface temperatures tend to be higher and more variable than air temperatures, but the two generally vary in sync with each other. 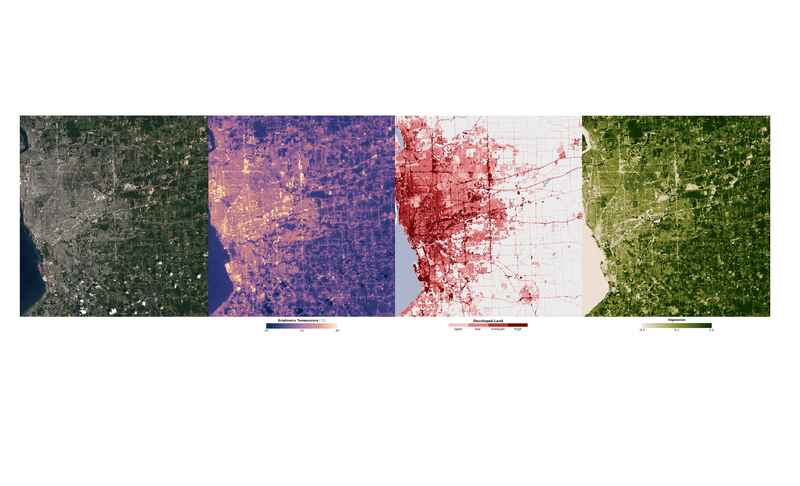 Most recently, the Goddard group has shown that a city’s development patterns — whether a city is sprawling or compact — can also affect the strength of its heat island. The compact city of Providence, R.I., for example, has surface temperatures that are about 12.2 °C (21.9 °F) warmer than the surrounding countryside, while similarly-sized but spread-out Buffalo, N.Y., produces a heat island of only about 7.2 °C (12.9 °F), according to satellite data. 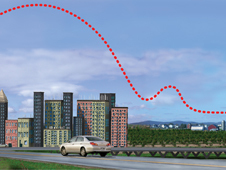 Since the background ecosystems and sizes of both cities are about the same, Zhang’s analysis suggests development patterns are the critical difference. 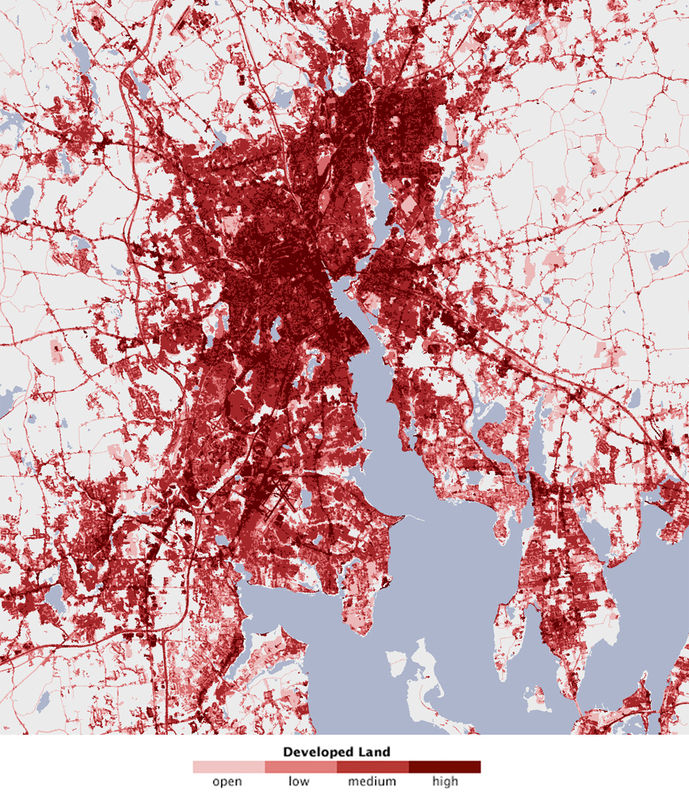 She found that land cover maps show that about 83 percent of Providence is very or moderately densely-developed. 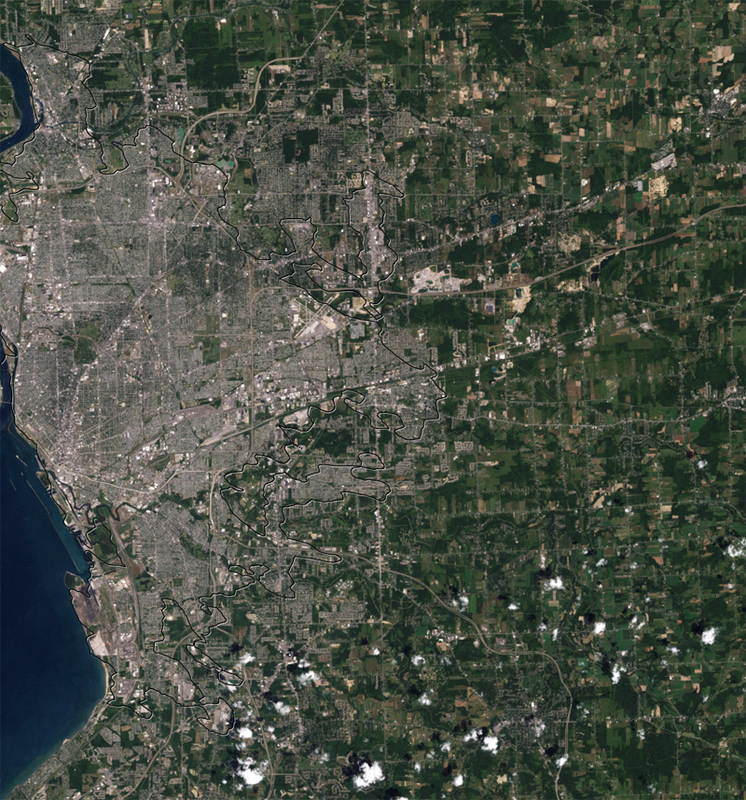 Buffalo, in contrast, has dense development patterns across just 46 percent of the city. 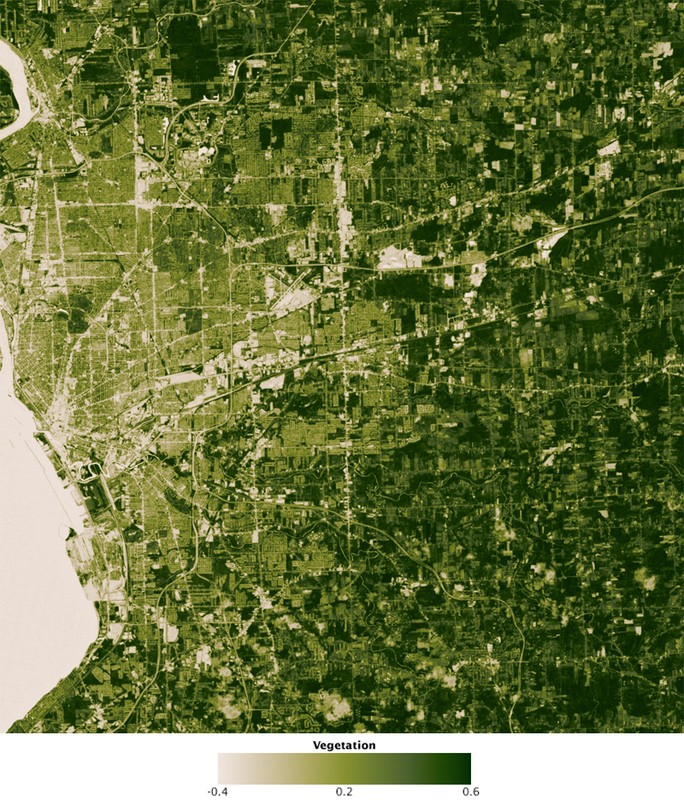 Providence also has dense forested areas ringing the city, while Buffalo has a higher percentage of farmland. “This exacerbates the effect around Providence because forests tend to cool areas more than crops do,” explained Wolfe. Ratcheting up temperatures can have significant — and deadly — consequences for cities. Heat islands not only cause air conditioner and electricity usage to surge, but they also increase the mortality of elderly people and those with pre-existing respiratory and cardiovascular illness. “It is the lack of cooling at nighttime, rather than high daytime temperatures, that poses a health risk,” said Benedicte Dousset, a scientist from the University of Hawaii who also presented data about heat islands at the AGU meeting. “The finding raises the question: what can we do to design our cities in ways that will blunt the worst effects of heat islands?” said de Munck, who notes also that her research shows that some types of air conditioning exacerbate heat islands more than others. ← Dueling press releases – which is it: dead or weakened? I think we have a new cause. As I recall the assumption/adjustment for UHI in most GCMs is +0.5C. If I am correct, why hasn’t Hansen been shackled and perp-walked into a paddy wagon for a journey to the slammer? Wow! Detroit may be on to something, bulldozing buildings the make open land! It’s only 1/2 a degree…. Now, I thought that when us ‘skeptics’ have raised the issue of urban heat islands in the past as having a significant effect on perceived ‘warming’, we were told sniffily by the warmists that the effect was ‘negligible’. Surely we’re not being shown to have been right all along…! And what about ice, snow storms and cold weather? What happened to using night lights? It is gratifying to finally see some explicit acknowledgment of this – the magnitude of which is frankly, larger than I expected. Now – to just find out how GISS ‘corrects’ for their official data in these areas …. Intra-Goddard politics ought to be interesting right about now …. I did note that there was no earth lights at night image to compare to the surface heat image. Well, we’ve known about this but quantification must be good. To know growth of UHI over time would very useful I suppose, given all those thermometers in Urban areas/airports, used to calculate Global warming. Sorry, estimate Gw, I mean guess, I mean show what we knew was true all along…. we were told sniffily by the warmists that the effect was ‘negligible’. Are they really saying 20F warmer! If they are, that is a whole lot more than even I thought. Now we “just” need to locate the surface stations on those plots and compare “actual UHI” to the current “adjustments”. Heck, who needs a thermometer? Just drive by a gold course with the windows open, then drive by a large shopping area. People have known about this effect for hundreds of years. That’s why the aristocracy in Europe had summer houses in the country. In the Denver area, Molly Brown had a summer house in what was then the country (now it’s a suburb). They knew that being surrounded by grass and trees was cooler than being surrounded by buildings and concrete. Heat in Providence and other coastal cities may be greater than the surrounding forested areas because of the ocean influence. Summertime afternoons are dominated by sea breezes that will cool the countryside while the city is still absorbing sunlight. Which is one reason I actually support such things as cool roofs and cool pavements. In places where the dominant climate control cost is cooling, such activities (according to a study by UCLA) can cut urban temperatures by up to 2 degrees F. That 2 degrees amounts to a lot of energy that doesn’t have to be spent cooling things down that additional 2 degrees. It turns into savings for everyone in the area. Also, things like “cool roof” technologies also help in even Northern winter areas. They provide greater insulation resulting in less heat loss and the white coating reflects heat back into the building rather than allowing the roof to act as an efficient radiator of energy into space (when it isn’t covered with snow). We have the technology at hand to reduce UHI by a degree or two in most places. Winter UHI is mostly due to heat loss, the same technologies that reflect heat away in summer also reflect heat back in during winter again resulting in lower energy costs. We might have a flake for the head of our Dept. of Energy but when he called for people to paint their roofs white, he was dead on the right track.. Doing that simple thing would save a large amount of energy in the US. Its interesting that the lack of vegetation seems to be so important. Is that why there is such a non-linear response to population? As I recall the urban heating effect kicks in pretty quickly as an area first moves from rural to lightly populated and then saturates quickly as population increases – at least this was the understanding before this paper? As developers move in the first thing they do is remove the vegetation, long before back-filling with concrete and people etc? These are just massive numbers, over 10 degrees C.
I’ve never ever seen an UHI estimate of the magnitude given here. The usual estimate is 2 or 3 degrees, at least afaik. It has been my understanding that the AGW proponents dismissal of UHI effects is based on the perception that the UHI impact is pretty stable, so that the larger scale trend in temperature will be the same, just with a different base. If however the UHI effect is as large and as variable as is reported in this study, that assumption is clearly in error and the debate about the impact of UHI on AGW is going into extra innings. A 10+degree C UHI effect will drown any 1 degree per century AGW signal. “Are they really saying 20F warmer! Don’t know the territory back there well enough to evaluate but here in WY the temp can easily vary that much with as little as 1000ft change of elevation in the winter with the cold settling into the lower areas, particularly along waterways. And that is without any real heat islands to contaminate the situation. Hunting many mornings this year before dawn it would be 5 to 10 F at 5000ft and 10 to 15 below 0 F at 4000ft. The entire notion of monitoring ground level temperatures is very unscientific since there are many, many variables involved in measurement locations that are not well taken into account. Heat islands are just one of them. Obviously, one can get what one wants by location selection. Another group of NASA scientists will have to removed from Hansen’s christmas card list. Chiefio (E.M. Smith) had an interesting post on his blog re night lights as proxy for urban heat islands. Re the deaths in the Paris heat, I seem to remember reading somewhere that a lot of that was because the older folk didn’t have air-conditioning and had no one to check up on them. I can’t believe they’re advocating shutting off air-conditioning when it’s one of the best advances in heat adaptation. Obviously, there’s no mention of cold mortality because that’s just not on message for CAGW. Wonder why they didn’t also analyse the accuracy of night time pixel counts as the proxy for UHI in the cities they studied. But then, maybe they did and decided there was nothing to see there and moved on. Also, it seems funny that there’s no warning that by 2050 UHI will combine with AGW to make the cities of the world uninhabitable in summer months. Sorry to be pedantic, but we really should encourage precision in language here. It is vitally important to distinguish between observed UHI (as here) and what we might term Delta UHI – change in UHI over time – as population grows for example. If there is no change to UHI over time (as might be the case in a city that has reached physical limits and is no longer growing) then UHI will in that case will NOT be making a contribution to observed warming, coz the temperature in that city will likely NOT be increasing. ie Delta UHI will be zero. In contrast, where a city is growing rapidly, and formerly rural temperature stations are being overwhelmed by development, the Delta UHI will be substantial, and making a contribution to observed warming. Clearly that contribution should be excluded. The performance of “The Team” in dealing with this issue (actually NOT dealing with it) is one of the main reasons that they have lost credibility. An interesting point. If the Global Mean Temperature can be hindcasted correctly by global climate models without accounting for interference by the Urban Heat Island effect, they are wrong. If the GMT is skewed by UHI, then the GCMs are DOA, ok? It’s only roughly an order of magnitude higher than the GISS anomaly. No biggie, right? And why then do we trust the historic surface temperature record ???? Are they, perhaps, setting it up to turn all of the exaggerated temperature trends on their head and take control of the world through a quest to combat global cooling? Certainly once they make the appropriate corrections to the data they’ve been gathering, we’ll be in a hocky-stick drop in temperatures which is “unprecidented in history” and must be man-made. Err, Doesn’t this mean there’s thermal radiation escaping to space? Wait a minute – I lived in Buffalo. It rarely gets over 90 degrees in western NY because of the lake effect. Of course there was a notable exception the day my brother got married – almost 100 degrees in an church with no air conditioning! The reception was a lot better than the wedding! At any rate, I hope you’re not attempting to compare the climate of Providence with Buffalo – no nearby Great Lake to cool it down. Ocean doesn’t count with most of the weather coming from the west or south. resulting from hurricanes, lightning, tornadoes, floods, and earthquakes combined. extreme heat than from hurricanes, lightning, tornadoes, floods, and earthquakes combined. My question: Does this figure include the considerable number of heat related deaths on our southern boarder? Changes in the incidence of heat-related deaths may have more to do with changes in border enforcement than with climate. The amount of warming according to the theory formerly known as AGW over the past century or so is about 0.7 degrees C, IIRC. I doubt there are any cities on Earth that have not had a significant delta UHI over that period. For example, I knew someone who was born on a dairy farm in Brooklyn. How many farms, let alone dairy farms are there in Brooklyn today? Furthermore, there has been a great shift in population from rural to urban worldwide. Now I believe more than half of the world’s population lives in cities, whereas a century or so ago most of the world’s population was rural. In addition, if you expand your scale to that of the “hokey stick” (sic), I think a decent argument can be made in most cases that today’s observed UHI is roughly equal to delta UHI over say a thousand years. There is also a paper by Pielke that has a very strong correlation between warming and development, but I need to look that up. It may well be that there is anthropogenic warming, but that such anthropogenic warming may be due to development, land use, etc. and not necessarily CO2. So spending countless trillions on reducing CO2 may not provide any measurable improvement. Painting roofs white is a great idea. Comparatively speaking (to CO2 reduction), it isn’t that expensive and it does not have any real drawbacks. All the hyperventilating over stupid windmills and here we see energy being poured into the atmosphere wholesale. What a ridiculous waste. There’s a fortune to be made here in cheap, effective waste heat recovery. What you say is true – it is the delta that is important. However, this research which suggests a very large UHI effect suggests that the actual delta could indeed be significant, i.e., size matters. The interesting data would be the size of the UHI in Siberia and China as development takes place and the UHI of relative small locations close to the Arctic Circle. The other issue is that spreading temperatures based on a simple algorithm a la GISS and CRU/Jones may lead to many funny results. The UHI appears to be a function of impervious surface and surrounding vegetation. If there is a single industry that has grown exponentially it is air travel. The amount of impervious surface at the airport has grown almost everywhere since the introduction of the Boeing 747. The thermometers are mostly at the airport. Airport runways have gotten longer and wider, the parking areas have gotten so large at some airports you need to take a bus to the actual airport. Grass strips have become gravel runways have become paved etc etc etc. Yes that is true. However, at some point in the past Providence (for example) will have gone from 0c difference with the surrounding countryside to a 12.2c difference and this will be represented by an upward trend in the delta. If it took 100 years to go from 0c to 12.2c then the trend for that period has to be decreased by 12.2c/century. The big question is exactly how much of the warming in the past century is UHI ? If the IPCC included UHI instead of claiming it was negligible, wouldn’t the temperature graph look very different ? Why are urban weather stations used for the temperature sets when there adequate prestine rural stations dating back to 1900, in fact you only have to go back to the 1940`s to understand how UHI has effected these data sets. Urban and rural stations are compared so that the UHI effect can be removed from the urban signal, why not just use the prestine rural temps, is there a problem with this. Why has there been no peer reviewed study comparing rural with urban. This is not science it`s trickery. Anybody plotted the position of the weather stations against these data ? This is certainly a larger than expected result, 10+ °C is very significant. Maybe only 0.5 °C of the total global warming has been the UHI. Oh, 0.5 °C is the entire warming that has happened in the past 70 years. One more reason to ignore station data. The UAH still shows warming in the Arctic and cooling in the Antarctic. So something is going on, but surprisingly enough it isn’t what warmists would like us to think. True, but would be hard pressed to find a major city (except Venice) that has stayed the same size over the last 100 years. Since cities have grown over the last 100 years, then their UHI has grown and that must be subtracted from recorded temperatures to get accurate changes. If these kind of temperatures as reported are correct, then as rural station records have shown all along, there is no significant global warming. My initial skepticism looks at the comment about Las Vegas (as having little UHI), contrasted to the Las Vegas UHI report on WUWT showing a large change, and having some doubts to accuracy. True, the WUWT report was one day with one sensor. My personal view (and I could be convinced otherwise) is that the impact of UHI effects on estimates of CHANGES in global average surface temperature can only be significant on time periods of at least a few decades. Cities tend to take a long time to develop and grow. Yes, all the data show that any city is warmer than the surrounding countryside, often by a substantial amount, but how much has that temperature difference changed from last year? 10 years ago? 20 years ago? 50 years ago? The easiest way to look at the impact on global average temperatures is to compare estimates based on surface measurements (which are affected by UHI, and subsequently adjustmented to neutralize the impact) against those based on satellite measurements (which should be completely immune from UHI effects). So, when the difference between the two estimates is only +0.018 deg C / decade, I can only conclude that either (1) UHI is adequately corrected for, or (2) if the adjustments to correct for UHI are somehow inaccurate, the net impact is close to trivial. thats very true – but here in the Uk, there are other issues – such as when central heating was installed and coal fires (where most of the heat escaped out the chminey) stopped being used. Then you have the issue of motor vehicles – as in the actual number of vehicles on the road in a city, and the length of time they are on the road due to increased traffic. IMO – any records from towns and cities should be given a very wide berth because back analysis will not be able to accurately define warming due to UHI. Has anyone performed a check of GMT trends from ONLY rural stations? Glad to see those corrupt researchers at NASA’s Goddard Institute for Space Studies are finally being shown the truth by… researchers at NASA’s Goddard Space Flight Center. Will Dr. Jones now resign? Careful here. They are talking about temperature on the surface, not the temperature a few feet above the surface. Even in mid-winter Minneapolis when the official temperature is -10F, it is not at all unusual to record streets and parking lot surface temperatures of 40F. That is how why you see dry pavement in mid-winter Minnesota. But surface temperature is not UHI, though the two are connected. So….. it may be -10F in Minneapolis, the asphalt in your parking lot may be 40F, and -12F in the distant burbs. The 2F difference is UHI, the 50F diff in the parking lot is merely micro-climate. I have always thought that there os some evidence that the smokey/foggy cities of 100 years ago were actually cooler in the winter, if compared to comparable sized cities today, due to the fog and smog. So in the winter the UHI effect over time has actually gone from sort of negative to extremely positive. In summer all the heat expelled from air conditioning systems makes modern cities much hotter when compared to comparable sized cities of 100 years ago. Now we know why the urban glaciers are melting. and re-run of the Monte Carlo Roulette wheel Global Climate Models ? That is going to leave a mark, methinks a distinctly downward facing mark. IF the tables turn and a new regime is discerned, will we still have to rely on the same group of numbskulls and frauds to study it ? What matters is not how much warmer a weather station located in the City is than a weather station located outside but how much warmer that City station has become over time. It’s been suggested that measuring the changing population density would be a useful way to calculate that and this study seems to confirm it. Wow.. 2 items below you called for a sick bag and to boykott the AGU, now they are good again for news. How inconsequent is that? Either you shun them or you don’t. London also generates its own microclimate, known as the Urban Heath Island (UHI), which can result in the centre of London being up to 10°C warmer than the rural areas around London. It would be interesting to see the central London temp data from 1860 to present. The Urban Heat Island Effect has been examined quite thoroughly and simply found to have a negligible effect on temperature trends. Real Climate has a detailed discussion of this here. What’s more, NASA GISS takes explicit steps in their analysis to remove any such spurious signal by normalizing urban station data trends to the surrounding rural stations. It is a real phenomenon, but it is one climate scientists are well aware of and have taken any required steps to remove its influence from the raw data. Normalizing urban station data trends to the surrounding rural stations. If they can do that they must have enough rural stations to construct the data set in the first place without using the currupt urban data. Not only do Pro AGW “scientist” underestimate urban heat island by an order of magnitude, in many cases these “adjustments” are used to actually cool the historical record and make the present appear warmer. No one really notices or complains when temps are lowered a degree for say December 1910. And all of a sudden AGW appears out of thin air, except it is not actual warming, it is an artifact of MANNipulation. It would be funny in a sad scary kind of way if these rent seeking “scientist” searching for the heat demanded by global warming actually missed the start of a potentially harmful cooling trend. 1. The peak bias you see of 7C to 9C is by no means a daily occurance. 3. The bias is modulated by winds ( over 7m/s) and by clouds and rain. with data down to 30 cm accuracy! Makes sure you read all the newsletters. established at the end of the 18th century by cartographer Joseph de Ferraris. that there are hot spots and cool spots. It all depends where the temperature sensor is placed. 1. focusing on peak measures. 2. Thinking the urban enviroment is uniformly hotter. As Oke has shown and these images confirm, there are substantial cool islands as well. Also, Oke has shown that the magintude of UHI depends on the surrounding rural enviroment. 3. Expecting all the warming we have seen to magically disappear. i know you (watts up with that) have been talking about UHI for along time. It seems so obvious. I dont understand why it has taken so long for the dark side to think about this. Im glad to have had this website educate me on this matter many months ago!! thanks!! But Hansen’s GISS “claims” that he needs only a 0.01 “correction” for the total UHI impact on ALL thermometers worldwide. Yet the cities average 5.0 to 7.0 degrees C higher. The Ping Zhang and Marc Imhoff AGU presentation effectively refutes Phil Jones’ and teams’ claims that UHI is so minimal that it can be ignored. Would someone who is conversant with Jones’ paper(s) on this subject please post the citations for one or two of the most widely cited papers on this subject. I would like to use this information to challenge a couple of “reporters” who write on this subject. btw, the leak of the CRU emails has, IMO, had a large and growing result. McShane/Wyner, O’Donnell, et al, the widespread derision with which the various “investigations” were greeted, Judith Curry’s road that lead to her Climate Etc. and various other dialogues of her’s with we “denialists” that resulted in the RC crowd accusing her of apostasy, a Congressional hearing with the likes of Lindzen being invited are a few examples that come to mind. More on this in Tips and Notes. Your point about Delta UHI is only partly valid. If the total number of measuring stations has been skewed towards urban areas (as I believe is the case) then actual UHI is significant. And even if this were not the case, UHI as a human contribution to global warming becomes more significant than human CO2 emissions. Take a look at the graph of global human population growth. After about 1950 it takes off like a rocket. Also, why then would it be ok to extrapolate over large distances if they are indeed ‘prone to local bias’. Lots of impervious surface area at airports where many weather stations are located, although not so many people. If the metric changes from night lights to impervious area, the UHI adjustments at airports will be large. Why is this such a freaking surprise? Ten years ago I was at an ASHRAE conference where the EPA representative was talking about green roofs to reduce the UHI effect – apparently it’s only a heat island when it’s convenient for their specific philosophy. Or maybe an EPA heat island isn’t the same as a IPCC heat island. Aaaargh! It would seem to me that the calculations to set the temperature anomalies, thus proving we are warming to hell are anomalous. Kinda sorta fudged unintentionally on purpose. NASA would appear to have some scientists that are prepared to buck the system, one can hope that they are not pilloried in any way. Taking into account the large number of badly sited thermometers, The death of many thermometers and the UHI misrepresentation, mass sackings and a new start to the temperature record is needed. My best guess would be that a real temperate record would show cooling from the high points in our interglacial, unsurprising as we are nearing it’s end. If you zoom in on Providence, the biggest hot spot looks suspiciously like an airport, Providence Airport I think. The “no expansion of city limits” speculation is absurd. Streets have been paved with asphalt concrete over time, converted from much less UHI effect materials, as have been parking lots, converted from PCC or other much less UHI effect materials. Each vehicle running emits at least 100,000 new BTUs of heat per hour, and roof coverings have changed from much less UHI effect coverings. Once raw land has been developed, single family home used property has been converted to apartments and high buildings, with hugely greater amounts of heat released. The higher the building, if heated or air conditioned, the more heat released. Asphalt concrete is maintained by slurry seal coatings or renewed AC surfacing, restoring streets, roads and highways to their highest UHI effect on a regular basis. Electricity usage and other fuel usage has increased greatly, emitting much more heat over time. AC units use power and emit lots of heat, as do any other electrical appliances. There is no “answer” to this UHI effect, other than reducing population density substantially, and converting back to “raw”, agricultural land, covered with greenery, and living in primitive conditions, and that’s not going to happen any time soon. Humans have to live somewhere, and now release huge amounts of heat by doing so, compared to yesteryears. BTW, a nation’s economy is directly proportional to the amount of energy consumed by that nation, as is the standard of living of the population. Think about it. Can someone explain the oft stated claim by warmists that the satellite temperatures are similar to the surface temperatures in recent history, so valiating the surface data? I think that the surface temps in an Urban area should be included in the UHI. We experience the heat of those surfaces. The radiation from the rock face on a building works just like the IR from the Sun, you feel the heat. If measuring temperatures is about what we, as humans experience, then we need to take the whole world into account, not just the ambient air temperature. Whether asphalt pavement, or concrete, or reflective glass walls, man has changed his environment. I disagree with almost everyone that has posted. It does not matter if a city has grow or not. Does not matter how many people, cars, etc either. Airports do not matter either. None of that matters……..
All that matters is that there is no way of knowing, and no way of correcting to 1/10th and 1/100th of a degree. Here are two examples of just two of the many cities, Providence, R.I. (21.9 °F) warmer, Buffalo, N.Y., about 7.2 °C (12.9 °F). The point is, no one can tell if any city’s UHI changed. And yet, with the thousands of cities, somehow they have been able to come up with some formula that is correct. Not just correct, but correct to 1/10th and 1/100th of a degree. There are too many cities, too many changes that can effect UHI………….. Looking at their slides they they are looking at the same stuff I have recently put into the metadata for GHCN V3. 1. 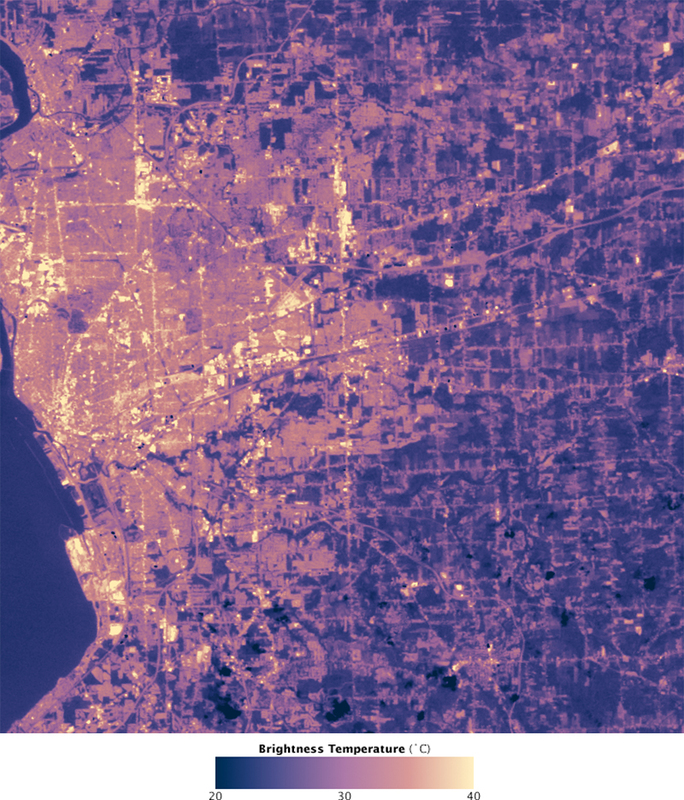 ISA impervious surface area from Landsat. Problem. ISA is not a measurement. ISA is an estimate based on a regression model that uses Nightlights and Population count. However, the population counts that go into ISA are Landscan data and Landscan data is proprietary, Still ISA appears to be a good predictor of whether a site is rural or urban. 2. They used surrounding rural landscape ( vegatation) this is good as well since Oke notes that the urban heat island is effected by the surounding rural area. Here they focused on land use, Oke suggests water use matters as well. True, but would be hard pressed to find a major city (except Venice) that has stayed the same size over the last 100 years. Since cities have grown over the last 100 years, then their UHI has grown and that must be subtracted from recorded temperatures to get accurate changes. They compare urban with it`s rural neighbour to extract the UHI signal out of the urban temp when they could use rural in the first place, someone please explain why this is acceptable. So science will have its day in the sun, no matter how many psuedo-scientists try to keep data in the dark. The question is, how many more bricks of the AGW edifice have to be kicked away before the whole rotten construction comes tumbling down? NASA GISS surface tempurature is trending at .17C/decade since 1980, UAH Satelite at .14C/decade since 1978. Satellite is lower then surface observation, surface observation are lower then ‘projections’, but alas ‘It’s worse then we thought’. NASA Giss 14 December 201 release of latest blatherings on their ‘new more accurate method’. well you can just look at rural sites. Here is the problem. 1. The characteristics which make a site rural are subject to interpretation. 2. The number of rural sites will be small the tighter you make your requirements. For example: if I use the tightest requirements in terms of population,nightlights, ISA, and length of the record, then we will be reduced to something like ~1000 stations. If they are geographical spread out, then the measure should be good. 2. we don’t have to correct for it. Basically you can estimate the size of the effect and add that to your uncertainty. This is what Jones does. Only Hansen tries to correct for it. Do you believe in the LIA? they are similar. they do validate the surface temps. For the most part people get confused by the “peak” claims for UHI. they hear that theUHI is 9C or 12 C. and they forget that this is agenda driven reporting that focuses on the peaks, on the heat waves. The problem with looking at these cases is as follows. 1. Peaks are quoted to support “green” programs in cities. Like planting trees, painting roof white. Money for relief from heat waves. 2. Averages are never quoted, that would not help the alarmist agenda. 3. The existence of cool islands ( cities as heat sinks) is only briefly mentioned although their existence has been known for a long time. 4. The actual stations that get used for the data are not in the urban places that get sited. Or they are adjusted before being used, or the UHI effect is estimated as a part of the uncertainty. When you select your stations properly and avoid dense urban enviroments, you see that the overall effect over time is mousenuts. Important mousenuts, but mousenuts. While I appreciate the idea of that (delta) being important to the overall science of the thing, for the moment, I would settle for a readjustment of “The warmest Year Ever”. Uh… what do you think Steve, they save it up for when the satellite passes over ? radiance calibrated nighttime lights were reprojected to the same one kilometer grid (Figures 2 and 3). greater than 800). The regression included 470,894 grid cells. The various products that estimate population density have some issues with airports. That is clearly not true. Satellite and ground station data are not absolutely known. What is used is the anomaly [change]! They were set equal to each other in 1978 when the satellites were launched. Since then they have diverged significantly and over time the satellites just keep getting cooler relative to the surface stations. size of the UHI effect in the global mean. To be precise you have to check the sat temps over land. The Study in Brussels estimated .7K of UHI over 180 years for a roughly similar result. not significantly impacted by urban warming. rural data with the rural data. The rural data showed a 0.05c higher trend, how? Perhaps Mr Mosher could reconcile “peak” with “average…over a three year period”. It only took 20 years to change the 0.1C per century assumption to 9.0C for individual cities. The world urban population has increased from 220M in 1900 to 3,495M in 2010 or 1388%. Now what percentage of the global temperature record is contaminated by urban heat island. Percent Land * Percent Influenced by UHI * Average UHI Increase since 1900. Just about the amount that the satellite trends say is either UHI or unjustified adjustments made in the temperature record. Let’s get the historical record corrected to about 0.3C or 0.4C of actual/real increase. 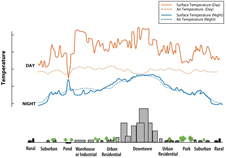 The crux of the surface data contamination issue lies not in the magnitude of the temperature difference between urban and rural sites at a given time , but in the magnitude of the difference at any fixed station before and after UHI or land-use changes were introduced in the area surrounding the station. Satelllite measurements cannot resolve that issue. And given the fairly unique characteristics of such changes at each station, no compensation for any specific station record can be reliably prescribed–contrary to the “homegenization” meme. It’s only in the aggregate averages that a statistical compensation for the discrepancy between urban and rural makes any sense. Such compensation turns out to be of the same order of magnitude as the putative “global warming.” That’s why no credible estimates of trends are possible where there are is no coverage by long-term (say >100yrs) uncontaminated rural station records. Such is the case form many regions of the world. Mosh, the post clearly says that two “similar” cities had a huge difference – 22F and 13F. About a 10F difference. You say you can “estimate” that and add it to your uncertainty……..
Providence has a surface temperature 22 degrees F higher than the surrounding area? Doesn’t this sound preposterous? Is it one small part of Providence? It does look like the airport. I think even Dr. Phil Jones would have noticed 22 degrees Fahrenheit. I am just dumbfounded and cannot believe this is the first time the UHI has been accurately measured. In that paper, Peterson dismisses a dozen studies showing large UHI values, because they had used raw data that had not first been HOMOGENIZED. So this is validation of surface data by satellite? I think this shows that it is simply stupid to mix old rural records with modern urban records with satelite data with traditional data. The variables are bigger than the measured trends. The only accurate comparisons are between weather stations that are, and have always been located, in rural areas. It is common sense. I’m not an expert, so I was wondering what the difference is between the “land surface temperature” that they are discussing here and the typically recorded air temperature. Is “land surface temperature” the temperature measured on the actual surface? Anyone who hasever walked bare-footed knows that paved surfaces are much hotter than than natural plant-covered surfaces. And while I would not be at all surprised to find that the surfaces are 10F – 20F hotter on average in cities, I don’t think this implies the average AIR temperature is also 10F – 20F hotter. Can anyone expound on just what is being measured by the satellites and how that correlates to the air temperature (typically measured 2 m above the ground if I am not mistaken)? That’s easily done. There are many stations that started rural and remained rural. You can easily calculate the warming from them. You can then compare them to the satillites, and to stations that have always been urban and to those that started rural and became urban. If you saw that rural matched the satillite, would that be useful information? yes. its called independent confirmation. Odonnell 2010. The paper that was praised for rebutting Steig. yes mark. It’s a PEAK disturbance. During a heat wave you can always find a place that measures very hot temps. Typically in a radiative canyon. if stations were actually located at these spots. 1. it would easily spotted. 2. the QC check for outliers will catch it. 1. You see if those cities are even used for the global index. 2. The QC check for outliers will spot an excursion this large. they can say that Brussels warming is 50% due to UHI. largely false. But since we do have records of that length that are utterly rural, would you have a hypothesis to test? a randomly choosen set of long rural records will show? Make a hypothesis. Its testable. I have compared rainfall and temperature records in a number of well scattered locations in Australia. I have found that, in the absence of UHI, annual rainfall is a good proxy for termperature, multiplied by minus one. (If its rainy or cloudy, then its cooler than when the skies are clear and blue, when its hotter). Take Adelaide city for example. The temperature was measured in a location at the edge of town which was well aired. Temperature moved in unison with termperature (times minus one) for over 100 years. Then the thermometer was moved into the centre of the town in 1978 (from memory). The measured temperature immediately started to climb and continues to moved up, year after year, away from the rainfall. Fortunately there is another thermometer at the airport some kilometres from the town centre and (strangely) this does not seem to be contaminated by UHI. The airport measurement had commenced twenty years before the move of the city thermometer and correlated closely with it and the district rainfall records. After the city thermometer was moved into the heart of the CBD and began to be affected by UHI, the airort thermometer readings continued to stick with the rainfall records. So it is possible to get a very good handle on the impact of UHI in central Adelaide and how it has increased with the passage of time. My punchline is a request for a scientist with access to suitable records to do a formal test of the relation betweem rainfall, temperature and UHI. (As usual appologies for typing and spelling errors. I hope my meaning is clear). Moderator – I can be contacted by email if you are interested in reading a paper on this subject. that’s a nice back of the envelop calculation. Understand however that the cities that see big increases are 1M plus in population. There are not 50% of these in the database. But, if you want an upper BOUND on how important UHI is .3C is a number that Jones himself cites, he settled on .05. When I wrote that temperature correlated with temperature, I meant temperature correlated with the inverse of delta rainfall. The problem with urban-rural comparisons and with the Chinese study of Jones, et al., 1990 is that rural (or purportedly rural in the case of Jones et al., 1990) areas also can suffer from UHI growth. If the UHI growth in the rural areas matches that in the urban areas, the urban-rural comparison will erroneously result in little or no difference in trend. Part of the problem is that climate science is burdened by not having a real good control when making their measurements (e.g. temperatures). Consequently, trying to find out how badly UHI growth may be contaminating the warming believed to be due to CO2 is not trivial. The previous analysis of urbanisation effects in the HadCRUT dataset [Folland et al., 2001] recommended a 1(sigma) uncertainty which increased from 0 in 1900 to 0.05°C in 1990 (linearly extrapolated after 1990) [Jones et al., 1990]. Since then, research has been published suggesting both that the urbanisation effect is too small to detect [Parker, 2004, Peterson, 2004], and that the effect is as large as (about) 0.3°C/century [Kalnay & Cai, 2003, Zhou et al., 2004]. The studies finding a large urbanisation effect [Kalnay & Cai, 2003, Zhou et al., 2004] are based on comparison of observations with reanalyses, and assume that any difference is entirely due to biases in the observations. A comparison of HadCRUT data with the ERA-40 reanalysis [Simmons et al., 2004] demonstrated that there were sizable biases in the reanalysis, so this assumption cannot be made, and the most reliable way to investigate possible urbanisation biases is to compare rural and urban station series. A recent study of rural/urban station comparisons [Peterson & Owen, 2005] supported the previously used recommendation [Jones et al., 1990], and also demonstrated that assessments of urbanisation were very dependent on the choice of meta-data used to make the rural/urban classification. 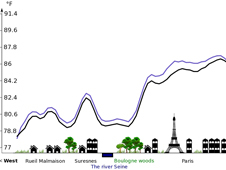 To make an urbanisation assessment for all the stations used in the HadCRUT dataset would require suitable meta-data for each station for the whole period since 1850. No such complete meta-data are available, so in this analysis the same value for urbanisation uncertainty is used as in the previous analysis [Folland et al., 2001]; that is, a 1(sigma) value of 0.0055°C/decade, starting in 1900. Recent research suggests that this value is reasonable, or possibly a little conservative [Parker, 2004, Peterson, 2004, Peterson & Owen, 2005]. The same value is used over the whole land surface, and it is one-sided: recent temperatures may be too high due to urbanisation, but they will not be too low. Jones, et al., 1990 is the paper that was the subject of an accusation of fraud because the paper claimed (IIRC) that there were “few, if any” station moves in the Chinese part of the study. One of the co-authors, Wang, admitted during the investigation at the SUNY – Albany that not only had there been station moves, but that the moves had been such that they required altitude adjustments! SUNY-Albany apparently furthered the (apparently admitted) fraud by redacting the admission in their final report. So, the importance of UHI was largely dismissed based on a paper where one of the authors essentially admitted failing to disclose significant station moves, while claiming otherwise in print. This paper (Jones et al., 1990) is then relied upon when CRU produced HadCRUT3 in 2005. In turn HadCRUT3 was then relied upon to produce the IPCC’s AR4 in 2007! becomes 1.75 to 2.25C annually. UHI is seasonal. In the worse cases ( cited by alarmists) it can give you results like that in the summer. In some cities, however, the city can become a heat SINK in other seasons. Its funny how people miss the alarmist spin. 1. The odd man out is UHA. 2. The satillites measure the temperature in the lower trop. no UHI there. small in impact. In either case the effect of UHI is small. Real, but small. To just explain a lukewarmer position. 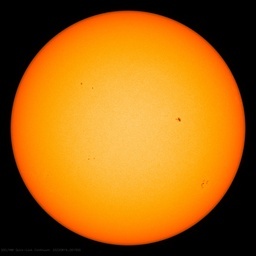 B. alarmist says that none of the warming we see is UHI. C. luke warmer is in between. Interesting question. Do people believe the record warmed between 1900 and 1940? Jones, et al., 1990 is the paper that was the subject of an accusation of fraud because the paper claimed (IIRC) that there were “few, if any” station moves in the Chinese part of the study. One of the co-authors, Wang, admitted during the investigation at the SUNY – Albany that not only had there been station moves, but that the moves had been such that they required altitude adjustments! SUNY-Albany apparently furthered the (apparently admitted) fraud by redacting the admission in their final report. So, the importance of UHI was largely dismissed based on a paper where one of the authors essentially admitted failing to disclose significant station moves, while claiming otherwise in print. This paper (Jones et al., 1990) is then relied upon when CRU produced HadCRUT3 in 2005. In turn HadCRUT3 was then relied upon to produce the IPCC’s AR4 in 2007! yes. If folks like ISA as a meausre of urbanity I can tell you what percentage of the land around a station is Impervious surface. Been posting about this for a while. Using the same data. 1) What effect can UHI have in the correlation between two stations when determining the match for extrapolation purposes? 2) What happens to the extra energy used to create the UHI effect? Does it go into ‘the pipeline’ or just radiate away? 3) If UHI is the result of extra absorption, shouldn’t there be more LWR available for absorption by CO2 particles, and hence more warming? I guess we could put up windmills and use some of the power to cool the cities.. The same value is used over the whole land surface, and it is one-sided: recent temperatures may be too high due to urbanisation, but they will not be too low. To clarify #3, UHI is the result of more absorption of SWR, resulting in more LWR radiating away. Thanks for your comments. Appreciate your emphasis on the specific local details in this simpler larger story, which in turn emphasize the fascinating complexity of it all. One of my posts apparently is stuck in moderation. Hopefully it will be cleared. A further comment, however, is warranted on those studies that seek to measure UHI or delta UHI by comparing urban stations to rural stations. I have read a couple of these and it strikes me that there is an assumption made that temperatures or temperature trends at so-called rural stations are not contaminated by UHI. The study in Barrow, AK (http://www.geography.uc.edu/~kenhinke/uhi/HinkelEA-IJOC-03.pdf), however, clearly shows that significant UHI (peaking at 6°C, but averaging 2.2°C) was present above the artic circle in the middle of the winter in a small community. Barrow has grown from about 300 residents to about 4600 in the 20th Century. The assumption that rural communities (where almost all of the rural stations are located) are not contaminated by UHI or delta UHI it seems may need to be avoided in trying to determine the magnitude of the UHI effect on temperature and temperature trends. How do you know if the “really rural” stations in the GHCN dataset are actually the best stations available. For instance for New Zealand GHCN contains a very small number of stations and many are urban. There is a large archive of NZ rural station temperature data that is available via the cliflo database but the vast majority of this data is simply not in the GHCN. So who assembled the NZ component of GHCN and can that component be trusted as being representative of NZ? What agendas were being served when the individual stations were chosen? Have the number of rural NZ stations in the GHCN declined since the early 1990’s (probably yes, and I recall EM Smith examining this issue). So I suspect we need to examine the whole of the GHCN database for “accidental” cherry picking of a certain category of rural stations because that’s what makes the nicest cherry pie. I would also caution you with respect to UHI and supposedly rural stations because the largest part of the UHI curve appears to be produced at relatively low population densities ( ie from near zero to not many people per square km). Roy Spencer posted some particularly good information on this issue a few months back on his blog. The consequence is that areas relatively modest population densty exhibit steep trends in UHI if the population density is changing. Such areas change in population density faster than the core portions of major cities. So “urban warming trends” can be greater in modestly populated areas than in almost any city. This effectively defeats the nightlights classification system employed for GIStemp. It also means you will need to be very careful drawing conclusions from comparison of mean trends from supposedly rural and known city climate stations. White paint is a waste of space, resources and energy. Do it natures way, save energy, water provide cooling or insulation and cash returns. Little market gardens in the city selling the produce in the corner stores. What could not be more American. Finally, someone discovers the incredibly obvious and publishes a paper about it. Anyone who has been in a large city during a summer evening and, during that same summer, goes to a rural or suburban location will be struck by the day/night temperature differential. I used to live in downtown Vancouver in a non-airconditioned apartment and July and August nights weren’t pleasant. Now that I’ve moved to Kamloops which has about the same population as downtown Vancouver, but spread out over about 100 square miles, summer nights are very pleasant even though summer days are often much hotter than in Vancouver. One of the factors that is likely supporting belief in AGW is the experience of city dwellers who never get out into the countryside and who make the usual human assumption that their local environment is representative of the remainder of the country. The only AGW that has thus far been found to exist is the UHI effect. 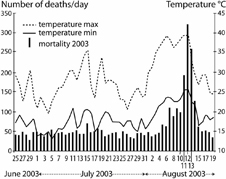 Given the magnitude of UHI that the referenced paper found, the idea that a single thermometer can predict the temperature of an area several hundreds of miles around that thermometer has been utterly demolished and one needs to recalculate average world temperatures with urban records being extrapolated to a far smaller land area than they currently are. Ideally one would have a grid of thermometers spaced a few hundred yards apart over a large area giving a much better estimate of average temperature for a given geographic area. The other option is to have people drive around the city with external thermometers whose readings are recorded with the GPS coordinates of each temperature reading to give the type of urban temperature profiles that Anthony wrote about some months back. Numerous posts on WUWT have shown that temperatures for rural locations have not demonstrated a significant increase over the last 30 years whereas urban locations have had temperature increases. Air conditioning is the simplest way of dealing with high summer temperatures, but painting roofs white is a simple thing to do as is watering roofs in areas with sufficient water supplies and low humidity. My solution to increasing UHI temperatures was to move out of a large city altogether. Hopefully someone who’s seen this post has recalculated world temperatures based on properly weighting urban temperature readings based on the builtup area of the city for the year temperature was taken (OK not as simple as I thought it would be). I suspect that such a calculation would give a far smaller temperature rise than the hockey stick shaped temperature records which the warmists are so fond of exhibiting. How do you know if the “really rural” stations in the GHCN dataset are actually the best stations available. 1. You go ahead and define what you think makes a station subject to UHI. B. Population density? How many people per sq km? 0, 10, 15. C. Nightlights ( electrification) I got better data than hansen uses. D. Urban extent: mapping of the urban area . Got that too. E. Vegatation. Got that but should probably update it. will warm faster than those with 0. Just present your hypothesis. Not speculation. Hypothesis. Then we can test it. Again, hypothesis? make one that is testable. The number of stations will not drive the numbers. On an area basis NZ is mousenuts. Basically, you can decimate the record and the numbers dont change or increase to 40,000 stations and the numbers dont change. More on the 40K stations when time permits and when it gets closer to release. Again, state a hypothesis that is testable. The stations were selected 20 years ago. Long before the metadata we can use to pick which rural we want. Actually thats a testable hypothesis. Nobody has asertained with accuracy the steepness of that curve. Population density matters, building material matters. building height matters. I can of course test stations that had <14 people per sq km from 1900 to 1940. no population change. wanna guess? make a hypothesis. If I look at stations that had no people in 1900 and no people in 1940 and comapre that with stations where the population went from zero to urban in those 40 years, what do you hypothesize? will you subject your belief to falsification? or verification? "The consequence is that areas relatively modest population densty exhibit steep trends in UHI if the population density is changing. Such areas change in population density faster than the core portions of major cities. So “urban warming trends” can be greater in modestly populated areas than in almost any city. This effectively defeats the nightlights classification system employed for GIStemp. It also means you will need to be very careful drawing conclusions from comparison of mean trends from supposedly rural and known city climate stations." well with nightlights, for example, I can pick stations that have no lights within 20km. dont neglect to read ALL the PDFs. they talk about “cool parks” 2-5C cooler. This is of interest because Peterson claimed that temperature stations were in “cool parks”. A testable hypothesis. That now could be tested with MODIS. I believe the wealthy built homes in the country because the cities and towns were disease ridden cess pits (and the hunting/shooting/fishing were better in the country). 2. The recent paper discussed in WUWT (22 November) shows that death rates in cold weather are about 100 times higher than hot weather. For instance for New Zealand GHCN contains a very small number of stations and many are urban. Airports grow over time. By definition. As aviation has grown from nothing at all to the Jet Age from 1920 ish to 2000 ish. So who assembled the NZ component of GHCN and can that component be trusted as being representative of NZ? NCDC. And a simple “no”. It’s guaranteed NOT to be representative as it’s airports. What agendas were being served when the individual stations were chosen? While I’d like to assert “malice”, it’s mostly likely “stupidity”. (“Never attribute to malice that which is adequately explained by stupidity”). That’s why the ASOS at airports has a feed that is rounded UP to whole degrees C for aviation use. (There is also a feed in 1/10 C, but it’s unclear exactly how who handles what… I’ve not done the leg work to audit an ASOS vs GHCN and check for verasity / 1/10 C). Airport thermometers are first and formost for airplane and pilot use. “Climatology” is a freeloader and gets the leftovers. Pilots want that thermometert as close to the runway as possible (as that is where the wings will be flying… 2 foot up dead center of the runway would be ideal… but they accept off to the side due to that whole ‘landing gear’ problem 😉 and they want any error to be to the high side. And thats a GOOD THING. It keeps you alive when you fly. Have the number of rural NZ stations in the GHCN declined since the early 1990′s (probably yes, and I recall EM Smith examining this issue). Yes, but not nearly as much as other places. IIRC, N.Z. lost the most southernly thermometer on the coldest island. Campbell? But it’s not the 1990s that matter. It’s the 1950-80 range. The codes like GIStemp make an average in the box out of those three in 1950, then compare that average to the “average of one” over the airport tarmac near the jet exhaust ‘now’; and say the “grid / box” has warmed. No, that is NOT an overstatement. That is exactly the kind of thing that is done. From 7200 ish thermometers at peak, to 1200 or so in 2009 IIRC. (and there were 8000 “grid / boxes” so many of them have NO real thermometer in them, just a made up number from thermometers up to 1200 km away… you can actually be comparing two fantasy numbers in the same box. With different ‘sources’ in the two time periods depending on what was available when). This just gives a giant “splice artifact” in the comparison. Yes, the code tries to correct for the changes. No, IMHO, it does not succeed. What you end up measuring are the error bands on the ‘corrections’ and the growth of Airport Heat Islands. In my garden suburb in Melbourne, Australia, streets lined with shady plane trees are noticeably cooler than other streets without large trees. (Plane trees also remove methane from the atmosphere 🙂 I have planted hundreds of trees in available urban spaces and grown a wild life corridor on the wasteland along railway lines. Why can’t the Greenies do likewise instead of jetting off to global conferences? Heck. I’ve been giving peer-reviewed lit examples like this for some years now. I’ve also looked at the seminal?? Jones et al 1990 Nature paper in some detail. With the benefit of hindsight, many of the Australian stations were poorly chosen. Many were at Post Offices, often near the centres of growing towns. Charters Towers in Queensland, PO smack in the town centre, was at one time one of the largest gold mine towns in the world. A prudent person would have expected some UHI effect. Thus, for Australia the delta UHI has changed with time; and the UHI that was measured for the 1990 paper was real, not a zero baseline. I guess the BOM knew this was the case, because soon after 1990, there was a significant Australian shift from Hg thermometers to electronic devices, coupled with a shift of stations from POs to airports. The Jones at al 1990 paper was simply wrong in places. The position of Port Lincoln is 1 degree wrong, the station at Bowen plots in the Pacific Ocean, to name just 2 narks. The studies I did were on the 2009 version of the code. It has 8000 “Grid / Boxes”. I believe the present version ups that to 16,000. The problem is that there are not presently 16,000 thermometers used for the globe. The peak number was 7600 (the data is still in the GHCN, but only for ‘old times’). The number used at 2009 end was about 1200. So in the ‘baseline’ you get to smear 7000 (some get dropped in processing) or less statins into 8000 boxes (or 16,000). Then in 2010 you get to smear 1200 into 8000 boxes (or 16,000) – so clearly a lot of those ‘boxes’ have a fantasy number created based on a thermometer somewhere else… up to 1200 km away. Now the first boxes are compared to the second boxes and ‘trends’ are computed. But trends of WHAT? Thermometers that don’t exist? And of those thermometers that do exist, most are in the USA. So at the end of 2009, GIStemp put in the ‘new’ USHCN set as well. (Now they can claim far more thermometers). But they are all in the USA, so the problem remains. Those grid / boxes everywhere else are still ‘half fantasy”. And in most places, filled with an airport. The percentages can be quite high (see above link). So that whole “we fix up the UHI real good!” is just another fantasy. 1/2 the time they do the UHI “correction” in the wrong direction anyway. The quantity of actual data used in the product of codes like GIStemp is vanishingly small. Just like the vanishing “rural” percentage of the GHCN data set. they talk about “cool parks” 2-5C cooler. I’ve long believed that the issue of UHI is of huge importance in the AGW debate. There are reasons to believe that, if UHI were properly accounted for, the total 20th century global warming would only be about half of the standard figure (i.e. little more than a third of a degree Celsius). It has been pointed out, correctly, that the absolute amount of UHI today does not matter. What matters is how much the UHI has increased by from 1900 to 2010. Clearly, in a large proportion of cities and urban environments UHI has probably increased by a large amount. This study indicates that UHI is far stronger than most people previously thought, in fact some of the figures are quite staggering. It then follows that corresponding increases in UHI 1900-2010 will also be much larger than previously thought. 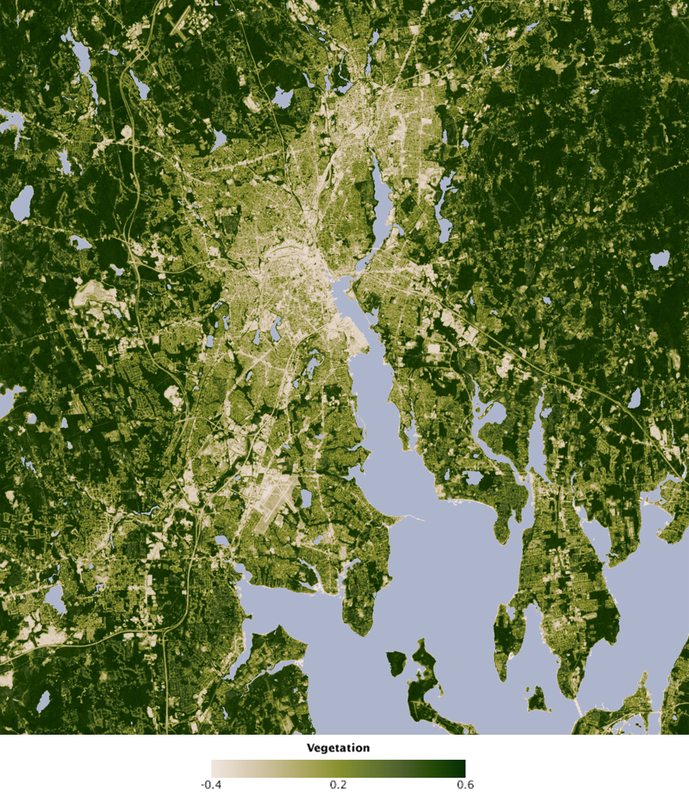 In the Providence image the most prominent heat island is the airport. I seem to recall that around half of all the reporting weather stations are located at airports…. Many warmists have started to use UHI to terrify us even more, despite the IPCC’s bizarre claims that UHI is insignificant. It is ironical that UHI may be the very thing that finally destroys the AGW delusion. Perfectly described – and it is something that is never really properly illustrated within data/graph presentations. I wonder what the largest distance between any two current stations is? As you say – Trends of imaginary thermometers! LOL – but the crucial word is ‘computed’ – as in ‘estimated’ or ‘guestimated’ using some arbitrary algorithm. As I said on another thread, an average temp of a station, averaged with nearby stations to form a gridded average, averaged with other grids, etc, etc to form some kind of GMT is ultimately statistically difficult to justify as valid methodology in my opinion. Sure, the defenders will say – ‘thats all we have to work with’ – but with homogenisation and individual station adjustments – it’s hardly raw data anymore! With the station number reductions, you have to ask why? Personally, I consider any global temperature anomaly produce to be absolute rubbish. I would easily accept localised (country scale?) trended anomalies, with good station data – but ‘adding’ them together with other less measured ‘countries’ – no way! It is and always has been a fanciful notion invented by the climate guys to try and scare the world. But isn’t it funny how specific analysis of many stations undertaken by ordinary bloggers doesn’t seem to support the ‘overall’ temp trends? My understanding is that, the surface, whether land or sea, presents a step change in the radiation characteristics of the materials present. This creates a steep gradient in the temperature profile as you move out of the surface into the air above. I would guess it is very steep, so (pure guessing now), most of the gradient will be seen within a foot of the surface. I imagine this is why the standard for surface temperature stations is several feet above the ground. The sea surface has this same characteristic but is “conflated” with evaporation issues. I have to call BS on this Steven. The disproportionate heating from the synthetic urban heat sinks (UHI) goes on all year. Perhaps social scientists should review the self reliance and Urban planning models implemented by Ieng Sary in the 1970’s as a way to deal effciently with the UHI effect. in the database. Its easy. Sorry, you need to keep up with the data that is out there. Do you believe the LIA was cooler? why? will warm faster than those with 0. A simple test for UHI, choose at random 100 rural photographed weather stations spread throughout the US, (it doesn`t matter whether they are in the GHCN data set) then choose 100 known urban stations within say 50 miles of each rural station, start from 1900 to 2000+ and compare the trend with each other, simple and you dont need complex maths to do it. Anyone with a lick of common sense knows that cities are warmer than rural areas. This is not news. What is new here is the researchers trying to make this an alarmist issue by showing how deadly it can be. More junk-science from the center of junk-science; NASA. One point that might have a diminishing effect on UHI in Buffalo: I would guess that the climate of that city is strongly influenced by weather patterns coming off the water of Lake Erie, which could, in summer, cool the entire surrounding area and mitigate any extreme urban heating vis a vis the surrounding area. Providence would not have that same mitigating factor. That’s an interesting point, Russ, and if reporting stations had remained as they were even thirty years ago, I’d agree with you. However, it does seem that there’s a distinct downward trend in the number of rural stations reporting versus urban and suburban stations. If this really is the case, and if the UHI reported above is anything close to being correct, an artificial trend would have been created. you can obtain the same results with 4 weather stations as you can with 12, 37, 121 or 476. Russia has 11.5 of the global mass. Air conditioning systems release waste heat into the atmosphere such that their widespread use can inadvertently elevate city air temperatures. I am happy to see this mentioned, and even more so that it is quantified to some extent. I’ve been asking about this for quite some time. It appears to be a real, but small, factor. I did not think it was major, but was curious as to what contribution it might have. Cities in desert regions, such as Las Vegas, in contrast, often have weak heat islands or are actually cooler than the surrounding rural area. A couple of years ago there was a post on WUWT about someone and his son who drove into and out of Phoenix and measured the temperature rise, which was (as I recall) about 7°F. That seems to support this finding, but not by much. Some of those NE city UHIs are freaking HUGE. I am terrifically happy to see this come out of NASA. What took them so long? Last comments: Are the warmists going to ask us to cut down in cities? Are we going to be seeing “Asphalt Credits”? I’ve never once argued that we haven’t affected the climate – but I have vehemently argued that it was not CO2, that land use is far and away the most prominent anthropogenic cause. And yet, what is there to be done, if it is land use? We can’t very well stop building cities. Or erase the ones we already have. A question to all the skeptics: Why do RSS and UAH readings show the same warming trend as GISS and HadCRU? Are there urban heat islands in the lower troposphere, several miles above the ground, too? The UHI overall for a city is X°C above the surrounding landscape. At the urban/suburban/airport weather stations it is Y% x X°C, with Y% being normally less than 100% and different in every case. Thus these peaks in urban areas is not totally captured in the global average, and the amount captured is unknown thus far. But what IS gathered now must be understood to be a TBD blend of UHI (as measured at the weather stations) and the rural weather stations’ readings. 2. The Chinese study that Phil Jones co-authored is now seen to be worse than worthless. 3. Just determining the UHI for any station is huge undertaking, all by itself. 4. In 2004 Michael Crichton in State of Fear pointed this out, comparing, as an example, NYC to West Point, 40 miles to the north. While the UHI effect – coming from land use – seemed common sense to us “deniers” long before that, it was swept aside and he was labeled a loony. I am sure Michael is smiling in his grave today. 5. YES, some of the UHI comes from burning of fossil fuels, since most of our internal combustion engines are used in cities and are spewing hot exhaust into the air. How much remains to be determined. 6. According to the codes as found in the Climategate files, CRU (lazily and unscientifically) uses an average value for UHI adjustments. From this study, it is clear that no average value can be used; each city has its own UHI adjustment due to several factors, and each of those adjustments will need to change over time, as each city grows or spreads out – and at times like now, maybe does nothing for a few years. Each city has its own UHI adjustment due to several factors, and each of those adjustments will need to change over time, as each city grows or spreads out – and at times like now, maybe does nothing for a few years. I think you are missing the point, view the Russia lecture from Amino Acids in Meteorites. All of this on UHI goes to show quite conclusively that when compiling data to show regional, national or global temperature or climate trends, urban reporting stations including airports must be discarded. Corrections for UHI cannot be estimated even for an individual urban/airport based station as it it is going to vary significantly on a daily and hourly basis. Up to now it looks like the inclusion of large numbers of urban and airport-based stations has obscured the real trends, either accidentally or deliberately. If discarding all urban and airport stations may results in few reporting stations in some countries, but this is far better than continuing to use a combination of rural and urban stations with no confidence in the resulting trends. The hypothesis I’ve already tested extensively is: Given UNCONTAMINATED century-long rural/small-town records, the regressional trend of time-series SYNTHESIZED from anomalies of ALL OTHER station-records (including urban) in the area is CONSISTENTLY very significantly more positive than that of the former. The key to such such testing is having solid analytic criteria for recognizing various nonstationarities and other flaws in records (including nominally “rural” ones). It is not just a matter of the clerical synthesis of anomalies, al a GISS, NOAA or Hadley– a practice that you blindly defend. Common sense should tell you that no UNBIASED estimates of SECULAR trend can be made where there are no uncorrupted century-long records reasonably densely available (i.e., most of the world outside of the USA). Although the extract is specifically about UHI, what “the Russian lecture” is hinting at is that Jones’ methodology seems to get the same warming trend what ever data he uses. Where have we heard that before? Perhaps somebody could run an experiment where they have two exact same sized (very large) buildings, one with more trees and a controlled Co2 level of say 380PPM, the other with less trees and a much higher CO2 level, say 600PPM. I’d like to see the temps of each of these controlled environments under the same conditions (they’d have to be close to each other and receive the same amount of sunlight, etc). Hmmm. Do they show the same trend? If GISS is adjusting the past downwards for UHI, which is grossly inappropriate, then no they are not. Of course, the climate models are based largely on data derived from sets using adjustments for UHI that may be wholly inappropriate*. If these models are currently able to accurately hindcast, but do not include issues with UHI, then these models are incorrect. This is one good reason to find out exactly what the contribution of UHI is to the global trend. Unfortunately, given this paper’s finding that “…ground-based air temperature sensors tend to be unevenly distributed and prone to local bias…” it is going to be difficult to accurately assess the accuracy of adjustments to the records. One thing is certain, though, the current adjustments are likely wrong in sign and magnitude. *- As far as I know, UAH and RSS weren’t used in development of climate model calculations, which means that the effect of UHI is being attributed incorrectly by the models, and possibly extrapolated to the future. I should have said …accurately assess the veracity…. I hate using the same word twice in one sentence. Exactly. But consider also that the met stations at airports are not 100% of UHI. Each one varies uniquely, and over time. Likewise, met stations inside the cities vary in where within each city they are placed. With such a severe spike from outlying zero UHI to the max UHI for each city, it becomes completely relevant where each met station is, with that UHI gradient so steep – and what adjustment value to assign each city. Mislocation by a mile will severely affect what adjustment is needed. And merely a 0.05C error would amount to 100% of the Chinese study that Phil Jones signed on to. But that 0.05C might represent only 300 meters or so. 5 or 12C is 100 to 240 times as high as that study – relied on by CRU – claimed. With a slope that much higher how is anyone to have any faith that the adjustments are done properly. Variables unperceived before now have risen up to complicate everything to do with climate warming and the 20th century. That Chinese study is so far down the crapper now a Roto Rooter wouldn’t bring it back. And all the GCMs have no idea of the validity of any of the continental data they are using. Of course, the climate models are based largely on data derived from sets using adjustments for UHI that may be wholly inappropriate*. climate models are not largely based on this data. they are first principles physics models. Read GISS ModelE. sorry. You only need look at the approach of Roman M and JeffId ( you know Roman from climate audit) to see what you say is not the case. If you would like to look at their code it’s posted. Or look at Nick Stokes code. Its posted. When you have something that runs with some decent tests I’m sure folks will take a look at it. 2. criteria for selecting them as rural. 4. criteria for selecting them as rural. Then, of course, you have to randomize your selection of the rural. no fair pulling micheal mann data snooping tricks. In any case I know of some work that is doing exactly this. What did they calibrate them against to make sure they were working correctly? Choose 100 US pristine rural stations from Anthony`s list, so many from each state, number them, throw the numbers in a hat, shake the hat and pull out 50 making sure there is one from each state. Choose 50 urban stations, one from each state using only cities or airports. Use the raw data from 1900 to 2000+ and compare the trend of both sets. Adjust for station moves etc then compare both sets again and then compare both results against each other. I believe that should indicate whether or not UHI is driving climate. You seem not to understand the analytic issue. If there is a systematic date-dependent bias due to UHI or certain other flaws in a great many of the archived records, Roman M’s algorithm applied indiscriminately to ALL the avaliable data can do nothing to remove it from the data sausage it produces. That urban bias is so plainly evident from INTACT records that even a 12-year old posted a You Tube demonstration for a score of USA station pairs. Amateurish “folks … tak[ing] a look at” the results of eliminating corrupted records via analytically incisive screening is not my goal or concern, as you would make it. Our technical reports as hired consultants are prepared for a professional audience. you dont get it. we are talking past each other. When you get ready to post code that we can talk about feel free.
. one from each state would not be a spatially uniform sample. Understand that the “raw” data from rural sites needs to be corrected for changing Time of observation. a human impact. 1. you need to adjust for more than moves. go to steve easterbrook blog and look at how GCMs are put together and tested. Get real! Comissioned technical reports by research groups are privileged intellectual property. I don’t violate the rights of our clients. And I harbor no ambition to become a blog star. There’s serious scientific work to do–with much more serious rewards.